Next week is the beginning of Passover. I love this holiday for the ritual, the gathering of wonderful people and the challenge to come up with new desserts worthy of the day. 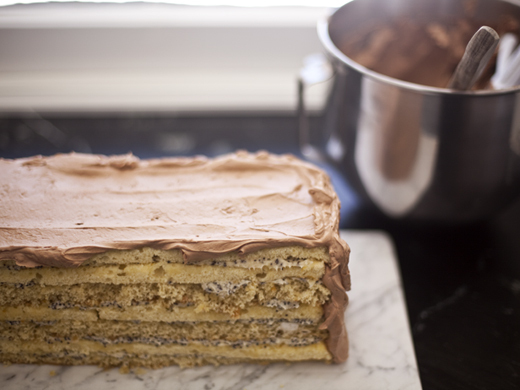 This cake was inspired by a conversation I had with Deb Perelman about Dobos Tortes, which is a cake made up of many layers (7 to be exact) of sponge cake, separated with chocolate buttercream and topped with a layer of caramel. It is a style of cake that is claimed by many cultures, each with a different name depending on heritage or the state you are standing in. Dobos Torte (Hungarian), Deberge Cake (New Orleans), Seven-Layer (I think of this as a Jewish cake from New York, but as soon as I write this, I’m sure I’ll hear from folks who will correct me) and Drum cake (I’ve never heard it called this before, but just read it on Wikipedia). Purists beware, my cake is so loosely based on the cake I described above, that it will make some of you squirm. Stick with me, give it another name if you need to, but try this version, it is delicious. One of my very favorite Jewish desserts are poppy seed hamantashen, which I need to make for you soon. They are cookies stuffed with sweetened poppy seeds. 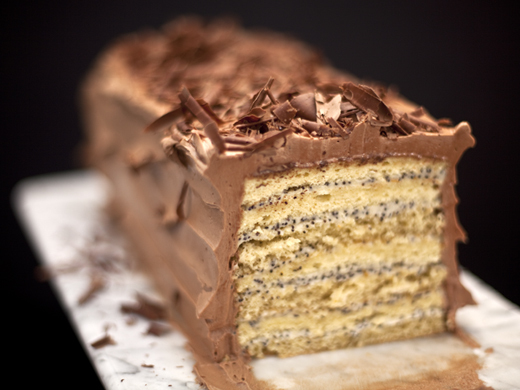 I thought the poppy seeds would be a fantastic match for the layers of orange scented sponge cake and chocolate buttercream. 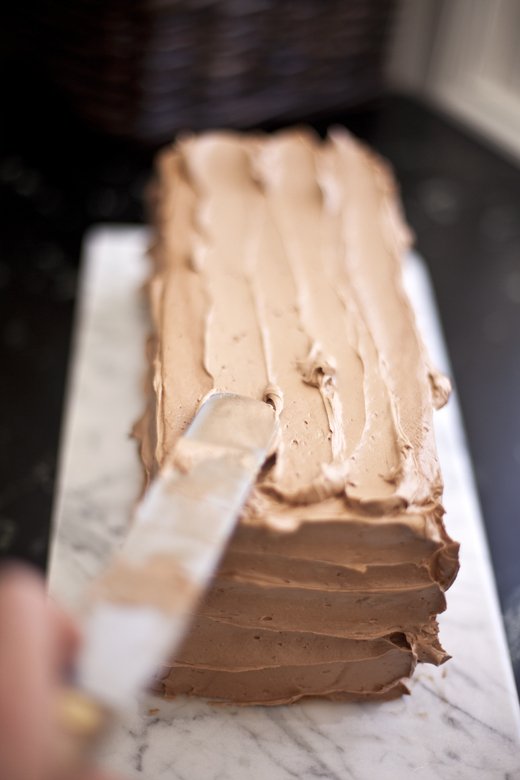 It is also stunning to cut into the cake and see the speckled icing. I left off the caramel top and added chocolate shavings. But, if you want to add a bit of caramel, for tradition sake, then why not make a batch of my Caramel Matzo and use it to decorate the top. Baking cakes without flour is something of a magic trick. The only saving grace to the baker during Passover is matzo cake meal, and it can be a touch overbearing if used all on its own. 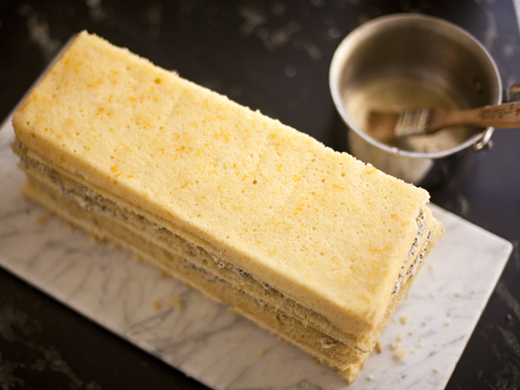 To create a sponge cake that is both delicious and light, adding a bit of potato starch to the recipe is key. 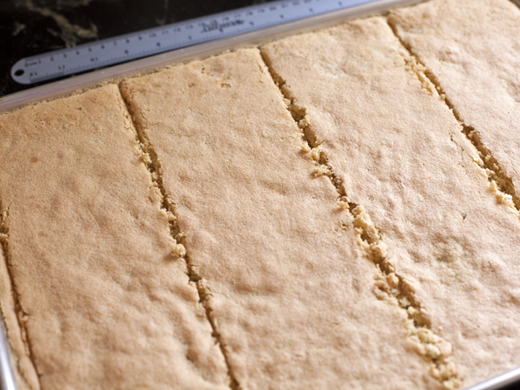 Prepare two Baking Sheets (13 x 18-inch) by greasing them and lining with parchment. 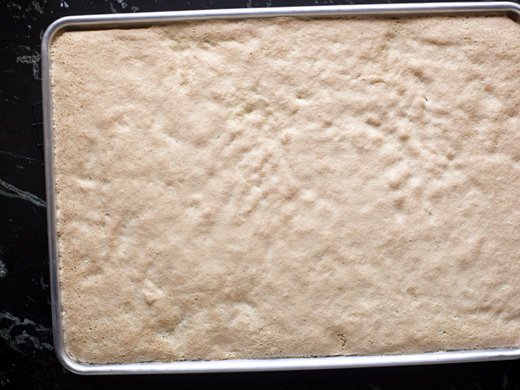 Sift the matzo cake meal, potato starch and salt together, set aside. 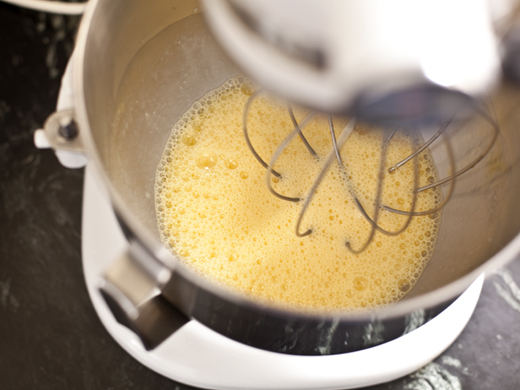 In a mixer whip the eggs and sugar, for about 8 minutes. The eggs should be very light in color and a thick foam. At the very end add the vanilla and zest. Sift the dry ingredients over the egg foam. 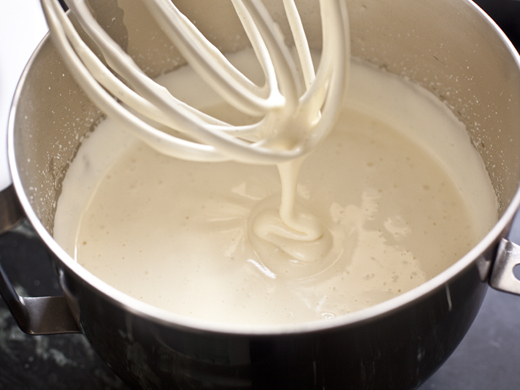 Very gently, but thoroughly fold the dry ingredients into the egg foam. Pour the batter into one of the prepared pans and spread evenly with a spatula. 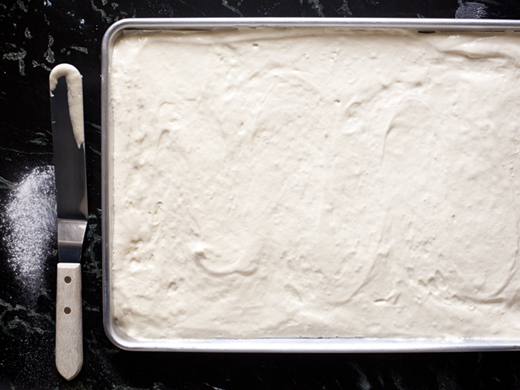 Bake the cake for about 18 minutes or until golden and dry when poked with a cake tester. Repeat with the second cake layer. In a small pot, fitted with a Candy Thermometer, heat 2 cups sugar, water and cream of tartar to 242°F. This will take several minutes, so get your eggs started. 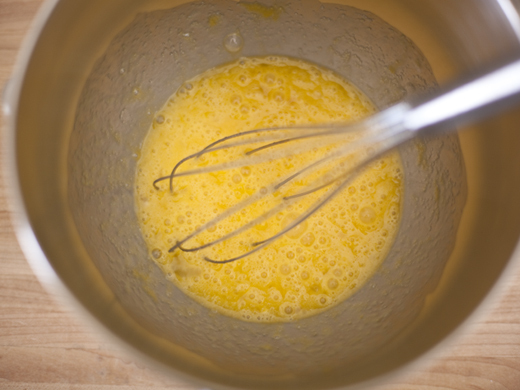 Whisk together the eggs, yolks and 1/3 cup sugar. Beat the eggs on medium high speed until light in color and thick. 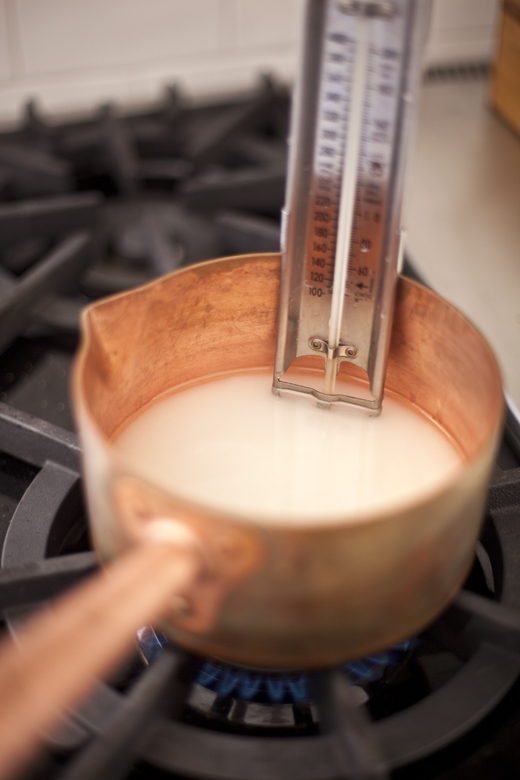 Once the sugar has reached 242°F, add it very carefully and slowly to the eggs, while the beater is going on slow speed. 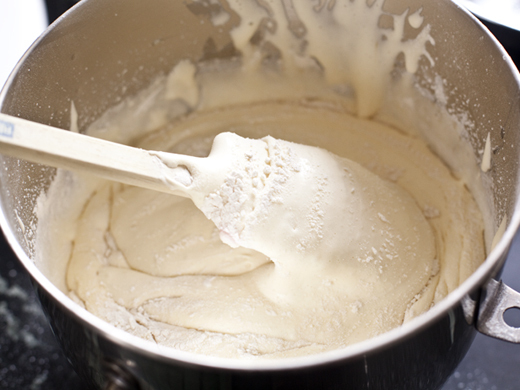 Be sure to pour the syrup along the edge of the bowl, not directly onto the beater or it will splatter. 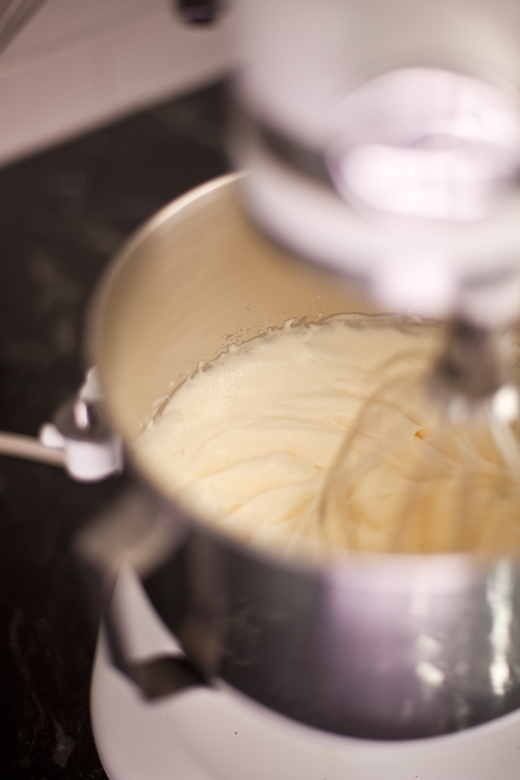 Continue beating the egg mixture on medium-high speed until the eggs have cooled, about 8 minutes. Once the eggs are cooled add the butter 2 tablespoons at a time. The mixture will go through a stage when it looks soupy and curdled, but keep adding the butter and it will come together. 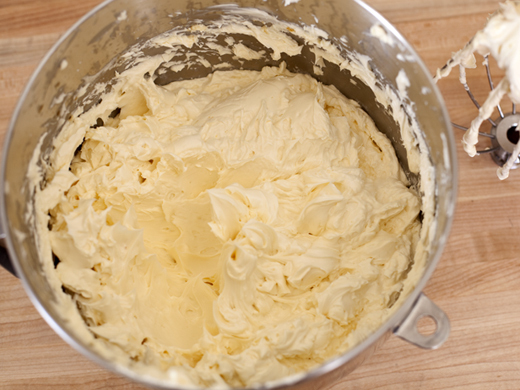 After all the butter is added, mix in the vanilla. 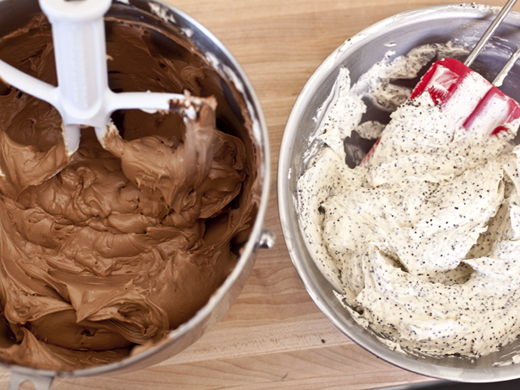 The buttercream will be smooth and glossy. 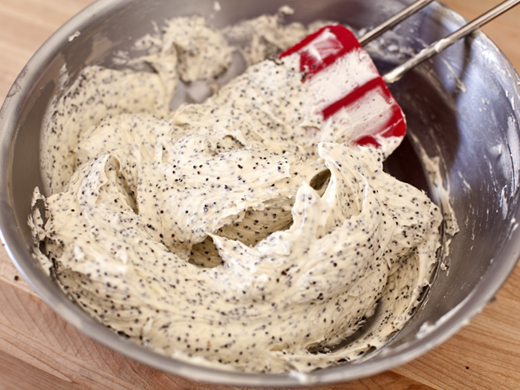 Divide 1/3 of the buttercream into a separate bowl and add the poppy seed paste. In the remaining buttercream add the melted chocolate. 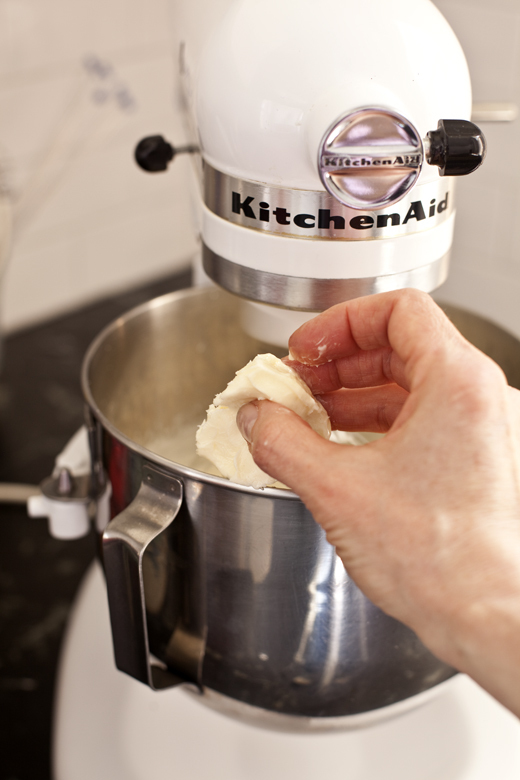 If you are not going to use the buttercream right away, cover it and leave it at room temperature for up to 24 hours. 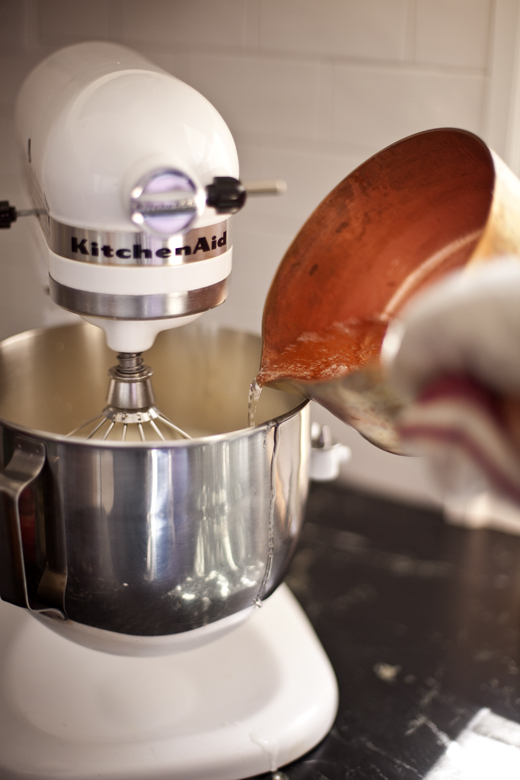 When you are ready to use it, give it a good stirring or put it back in the mixer and beat with the paddle attachment until smooth. In a small sauce pot heat the sugar, water and zest over medium heat until the sugar has fully dissolved. 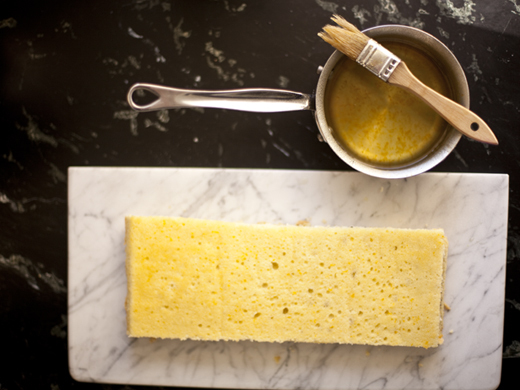 Lay the first layer of cake on the serving platter and brush with the soaking syrup. You want to dab the syrup on, but don’t overly saturate the cake or it will be soggy. 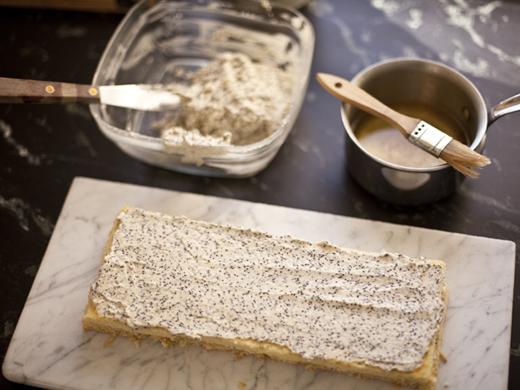 Spread a thin layer of the poppy seed buttercream over the soaked layer. Repeat with 5 more layers and then finish with the 7th layer of cake. This will leave you with one extra. Since my cake is not traditional anyway, you should feel free to use up that last layer. If you want to keep it to seven layers, then I suggest you use that lonely extra layer as a snack. 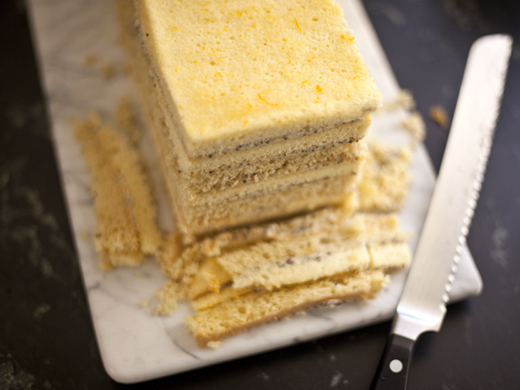 If your layers need squaring up, just trim them with a sharp serrated bread knife. 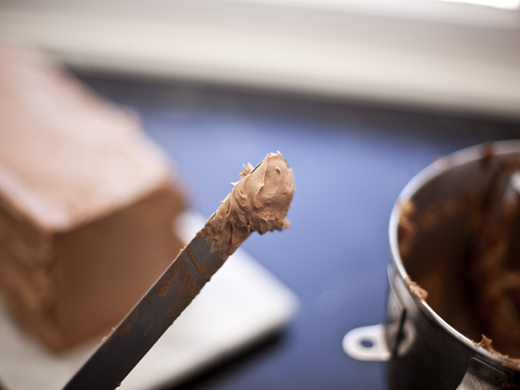 Stir the chocolate buttercream to make sure it is smooth and cover the entire cake in a nice even layer. It is okay if it isn’t perfectly smooth, because we’re going to add some rough stripes to the outside. Starting at the end of the cake, on the bottom, spread that blob in a stripe along the cake. Repeat over and over again, but alternate which side you start on. Repeat this on the top as well. 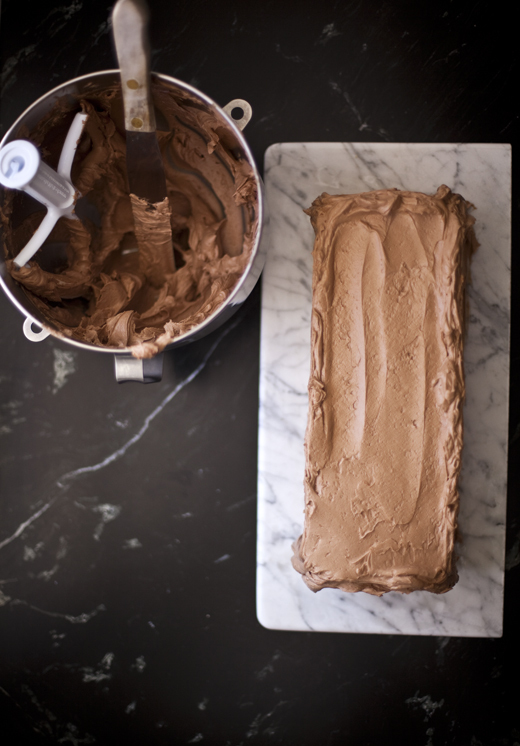 You will end up with rough stripes all over the cake, which gives the cake some texture. 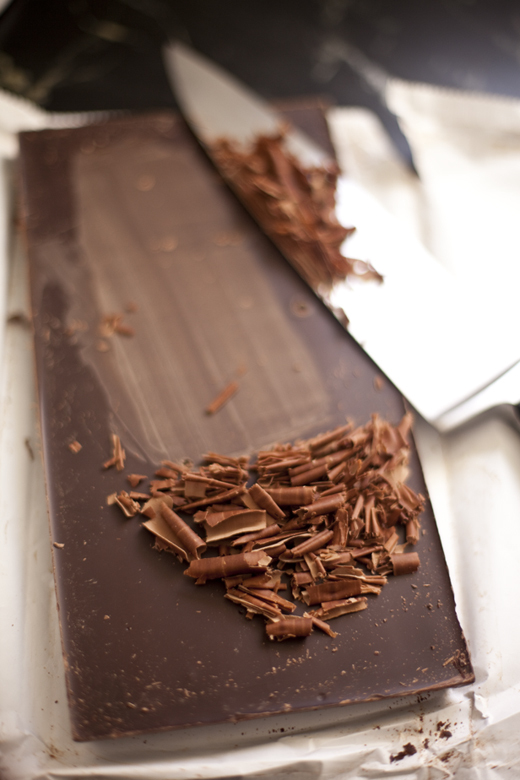 Using a sharp chefs knife, scrape the smooth side of a bar of chocolate with the blade, so that the chocolate curls up. If the chocolate is very cold and brittle, try sitting it in the sun for a few minutes and the curls will come more easily. 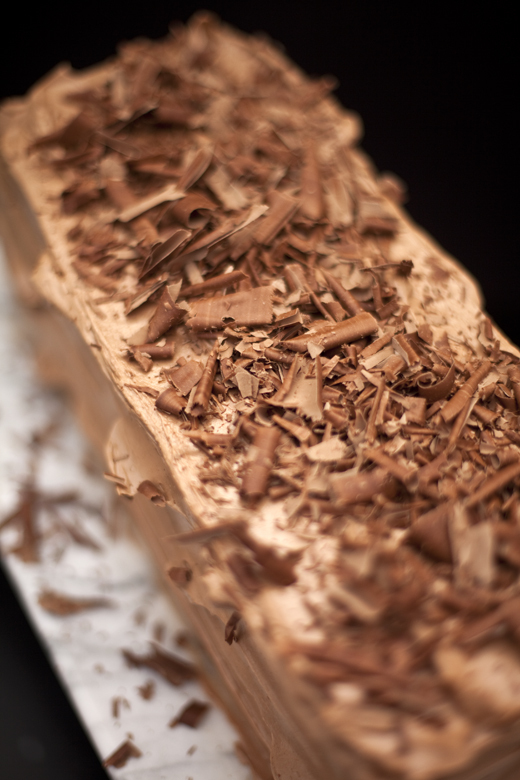 Cover the top with the chocolate shavings. Mmm so much goodness in here! 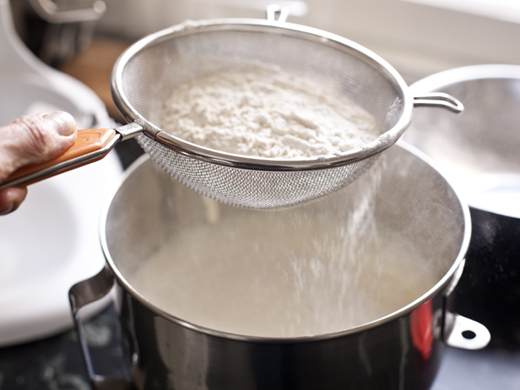 Can you use corn starch instead of potato starch? I love how you’ve made this into so many layers and managed to keep the matzo meal moist with the syrup. 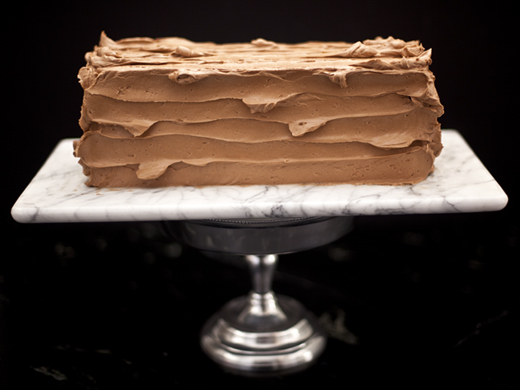 I made a layer cake similar to this, not for passover, and it had layers of raspberry jam in between. I think that could work well with this cake too. I’m making a chocolate torte for Monday evening but may have to try yours for the second night. Great recipe! I know i haven’t had this one yet! looking forward to lunch on Monday! Dear Zoe . . . Lovely recipe. I always run into the problem at Pesach of not being able to add butter to anything because we often have people who keep kosher so a meal that has brisket and chicken, can’t have a buttercreme or in my case ganache for dessert. I have settled on fruit filled macarons. 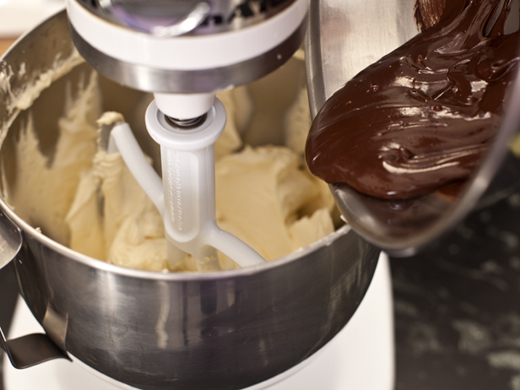 Got any ideas of how to make your frosting butter free? I love your website. Thanks! How lovely to see your name pop up! You can make any of this with a butter substitute. They have gotten much better as of late, because there are so many people with dairy allergies and vegan alternatives. I am not sure which are available in unsalted, but that is the way I’d go. 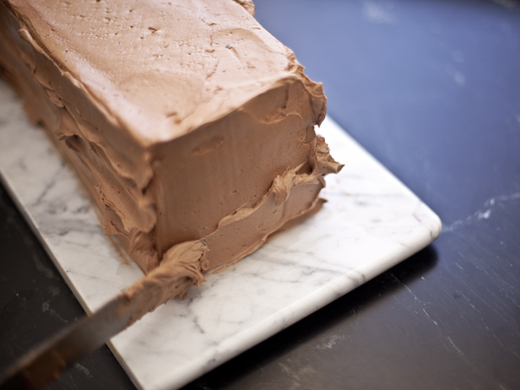 Maybe try a small batch of the non-butter-buttercream to make sure you like it. Instead of cake meal can I add almond meal. If so, would it be the same qty and also would I still need the potato starch then. Thanks. ashkenazi jews (i.e. from european countries, not sephardic jews from middle eastern countries) don’t eat various legumes and seeds on passover, called kitnityot, and poppy seeds are included among the ingredients not eaten on passover by ashkenazi jews (the majority of american jews). Shame as it looks like a beautiful cake. Thanks for letting me know. 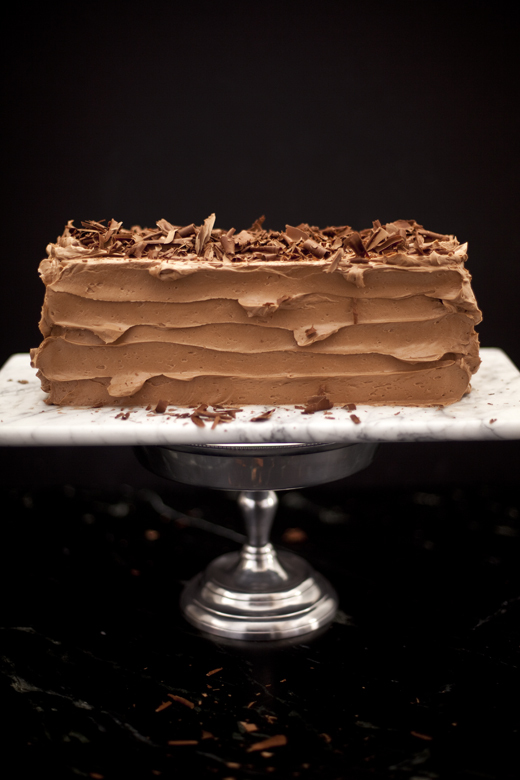 The cake is great when made with all chocolate buttercream, so that may be a good option for anyone who can’t use the poppy seeds. This is hard, I trying your recipe and another recipe but still failed. My sponge cake didn’t make a sponge like you did. I don’t think that I do wrong. Help me please! Can you tell me what your cake was like, so I can help you figure out what may have gone wrong? Is it better than the classic egg white one? does it have more flavor? can't wait to see more and more . The taste is a little richer, but the real difference is the texture, it is more luxurious than buttercream made with just the whites. I love both of them! Hi Zoe, this looks spectacular! I wonder if the sponge cake could be modified to use regular flour rather than matzo cake meal and potato starch? Would it be a straight substitution of flour for the matzo meal, or for both the matzo meal and the potato starch? Could corn starch be used instead of the potato? Yes, I believe you can just swap out the matzo meal and potato starch with flour. I would suggest going with a cake flour, since it has a higher starch content than All-purpose.It may have a slightly different texture to the cake, but it will be lovely.